Hamstring Build = More Burst, but much less forgiving if you happen to die. Will likey be used in higher ranks of play. Raffle Giveaways every night - to date we have given away over 500 Heroes of the Storm codes including Golden Tiger mounts and Ronin Zeratul Bundles! Fresh Meat! We will all be yelling that as we dive into the enemy team with Ruthless Onslaught! 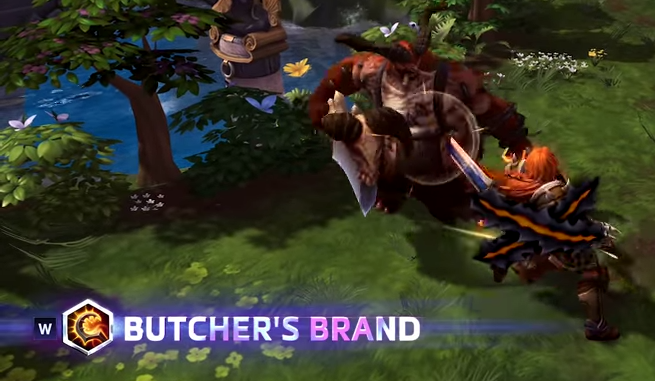 The Butcher is a melee assassin. Much like Thrall, he has some self healing to keep him in the fight longer than other squishy assassins. He also has a very unique trait - Fresh Meat. This will enhance The Butchers damage, as he gains 1% bonus attack damage for each that he collects. Managing this and keeping your stacks as high as possible will be a very big key to being a successful Butcher player. It should be treated much like Gathering Power, you want to avoid dying, as you will drop all of your Fresh Meat stacks (less if talented). Another unique ability that the butcher has is Ruthless Onslaught, it has some serious range! You can use it as a gap closer or even an initiator for a coordinated gank to another lane. On smaller maps, this ability will be extremely useful for your map presence and it should be abused when your team has the opportunities. 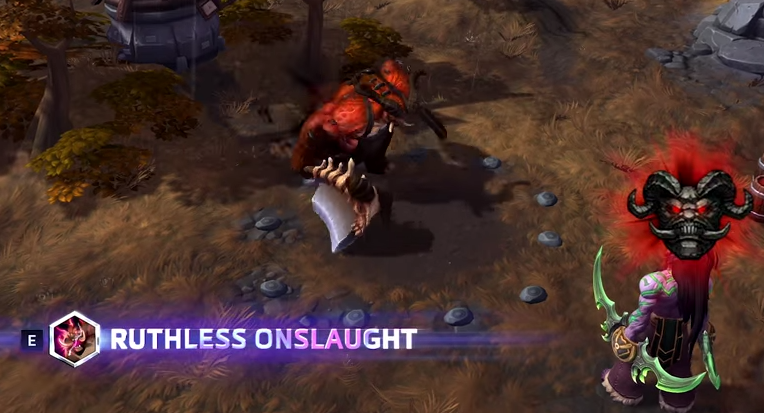 Based on the long ability cooldowns that the Butcher has, his main source of damage will be Auto Attacks! This guide will focus on the auto attack build to ensure you are putting out as much damage as possible! Other builds have been added as some variation, but focusing on the auto attacks and Hamstring should be very viable. I am still testing which build can pump out more DPS, both are viable, but have slightly difference play styles. We were a bit ahead in this game, but the single target ganks are good examples of how the butcher can get out of hand if he is ahead in the game. This is build is extremely punishing if you happen to die, as you will need to regather ALL of your stacks of Fresh Meat. Nearby minions drop 1 and heroes drop 3 fresh meat when they die, which you can pick up to gain 1% bonus attack damage. Can hold up to 25 meat. All meat is lost on dying. Slams your axe down into the ground, dealing 40 damage + (10 per level) and slowing units by 50%. This slow fades away over 2 seconds. Your next Basic Attack will strike immediately. After a 3 second delay, fire explodes around you dealing 335 damage + (35 per level) to enemies. Can be cast while using Ruthless Onslaught. Throw a hitching post that attaches to the nearest enemy hero after a 1 second delay. This deals 90 damage + (15 per level) and causes the enemy to be chained to the post for 4 seconds. There are basically two very good builds listed below. The "Auto Attack" centered build, which was hitting for around 630+ per melee swing at level 20. The "Hamstring Build" build has some outstanding burst but can be very dependent on mana. Victuals - This will be a beneficial talent for the entire game. It will give you great sustain and for the early game, it will ensure you can stay in lane to keep soaking that XP! It will also give you the ability to poke the enemy and quickly heal back up to gain the advantage. Another large part of this is that Meat will continue to drop even if you are at maximum stacks! You can clear a wave and get a large of amount of health back. This will be a very beneficial talent! This is also extremely benficial in team fights, when you kill an enemy, 3 Fresh Meat drop which will equal an instant 9% heal! Invigoration - With the reduced cooldown and reduction in mana cost, it will combo well with the tier 2 (	 Cheap Shot) and Tier 3 (	 Brutal Strike) selections. Block - The Butcher is starting to get focused hard in higher ranks of Hero League and Team League. This is starting to become a popular choice. I still prefer the other choices as I am a bit more aggressive in my play style. Chop Meat - Increased Hamstring's damage to non-heroes, this could be a good selection if you are going for a more lane/minion focused map. This also increases meat drops, which can cap out, so it will be come less effective, when you are capped on meat! Unrelenting Pursuit - This is a great ability that can really help you chase down an enemy, as the butcher you will typically engage with Ruthless Onslaught and having the reduced cool down likely means that it will be up at the end of the fight, chase away! Cheap Shot - If you feel that your team has enough slows/roots/stuns to take advantage of this ability, it could be worth it with the bonus 100% damage. Flail Axe - The extended range of this ability can help you poke and it is also very beneficial to chase down an enemy. Envenom - A standard choice among many assassins, even with the changes, it still provides quite a bit of damage. This is also a great choice if the other team has a stealth hero, as it will keep them out of stealth for 10 seconds! Abattoir - Increases your maximum fresh meat to 35 and you lose less on death. This talent will combo perfectly with Blood Frenzy, it will also increase all of your attack damage by an extra 10%! 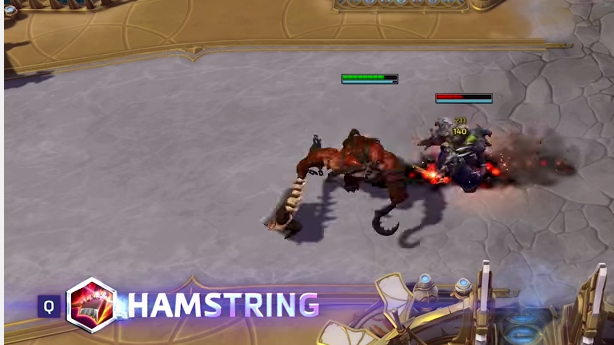 This also is setting up the level 16 talent, which will increase your attack speed by 35%! Brutal Strike - with the reduced cooldown from Invigorations, you can really start to abuse your instant auto attack after using Hamstring. If the enemy is slowed/rooted/stunned, this could lead into some insane burst! This is especially awesome since your Hamstring will have a 3 second cooldown and your next auto attack will hit for 50% more damage, which will be immediately after you hit wiht Hamstring. Insatiable Blade - Your healing on Butcher's Brand is already massive on enemy heroes, while this would increase your self-healing, Butcher's Brand can be interrupted, meaning one stun/poly/silence and this talent becomes a waste. On top of that, it is only a 25% increase (which will be doubled on heroes). Still better choices here. Final Assault - The range on Ruthless Onslaught is already pretty good, there look to be much better talents in this tier. While an increase of 33% could be helpful, there are just better choices for each build. Lamb to the Slaughter - This talent selection will be based on the enemy team, but I feel that Lamb to the Slaughter will pull ahead in higher ranked games. It essentially will attach the nearest enemy after a 1 second delay. It deals a bit of damage and also keeps them on the post for 4 seconds. While it doesn't prevent them from doing any actions, it will be a great way to ensure your assassins can jump on a target that is a threat to your team. It could also prevent heroes that are mobile from escaping. It also has a short cooldown of 60 seconds. The level 20 talent also makes this ability great - there could be some very good combos as a result of a 4 second chain on all enemy heroes! After a bit more testing, this Heroic is top notch, it scored me and my team a lot of kills when players were slightly out of position. We could get 4 seconds of uninterrupted damage and basically delete someone from a fight. It also helped a great deal vs. mobile champions in 1v1 situations. You are much harder to kite when they are stuck on top of you. I think this is a very solid choice and should be considered. 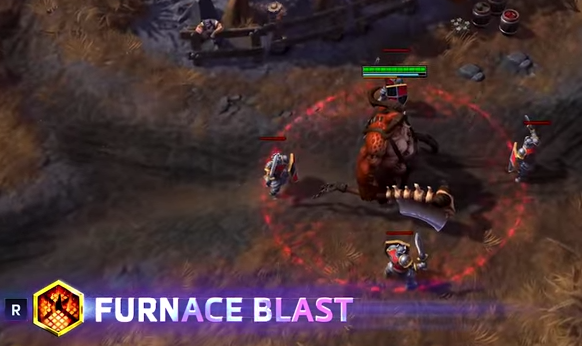 Furnace Blast - This will need to be used while charging in a Ruthless Onslaught, the damage has a 3 second delay. If you time it right, you could explode in a fiery blast right as you are arriving at your target! This could take quite a bit of practice and but if you land it, it could be devastating to the other team! It looks like it will be a large amount of damage on a relatively short cooldown. The only concern here is how avoidable it will be. It is quite noticeable that you are going to explode soon and the enemy team will knock you back, root you, stun you, etc. while you are a glowing red circle of doom. If you can consistently land the combo, and you have a coordinated team, Furnace might be the better choice. I found Crave Flesh to be extremely useful for the enhanced mobility. It lets you stick on your branded target and it gives you the ability to hunt down and chase those stragglers in team fights. It can also be used defensively as a mini sprint. The Butcher does lack some defensive mobility and this can really help with that issue. Crave Flesh - Further increases your mobility and lets you chase those sprinting assassins! It also can ensure you are landing your auto attacks over the 5 seconds of Brand. Burning Rage - While the Butcher has a lot of self healing, he won't be as tanky as a warrior hero, which means he cannot take full advantage of Burning Rage. Savage Charge - This is only 15% of the CURRENT life of the enemy, if you are charging a full life hero, it could be worth it, but the added benefits of Crave Flesh is just too good to pass up. Spell Shield - This is a decent choice after the changes. It provides quite a bit of mitigation from ability damage. If the other team is likely going to focus you, this could be a great choice. With the Block ability, you can become pretty tanky! If you have been getting focused early game, and they have heroes with Ability Power damage, this is a safe choice. This is one of my favorite tiers for the Auto Attack Build! Blood Frenzy - This really increases your damage capability as each stack of fresh meat increases your attack speed! This is like Nexus Frenzy attack speed @ level 16! This is an extremely good talent and I consider it a "must have" for many Butcher assassin build. Enraged - Low Health is 50% and it is on a 30 second cooldown. The attack speed bonus is 40% and you have a reduction in slows, stuns, silences and roots by 75% while Enraged. This is a great choice for a Hamstring build as it is not dependent on fresh meat. When combed with Butcher's Brand you can literally auto attack to full! The butcher will certainly be focused in many team fights as soon as he engages and this talent will help you stay alive in team fights. It also has a relatively short cooldown. Enraged - Low Health is 50% and it is on a 30 second cooldown. The attack speed bonus is 40% and you have a reduction in slows, stuns, silences and roots by 75% while Enraged. Given the fact that the perm. attack speed bonus can be 25% or 35%, I like that better. But I could see this being useful with a Brand to heal up to full life quickly. Crippling Slam - I wanted this to be good, but it just isn't necessary. You can stick to your targets without it and it also does NOT let you abuse Cheap Shot by yourself. The attack speed increase is just too good! 5/5 Nexus Blades - Greatly increase your attack damage and your basic attacks slow enemies. I think this is a great option to enhance the damage potential that you are putting out late game. Your auto attacks will hurt a ton in either build. 4/5 Slaughterhouse - If you have a coordinated team with some good AoE combos, this talent could be stellar when it is well timed. It will also help zone the enemy from objectives or peel when your team is trying to escape. 4/5 Fires of Hell - If you have selected Furnace Blast and you are confident in timing it, Fires of Hell could be extremely devastating and it could likely turn the tide of a team fight! 5/5 Bolt of the Storm - This is a common choice among high ranked and competitive players. The butcher will likely be focused HARD in higher ranks of play, Bolt of the Storm lets you live another day! The Auto-Attack build has some great lane presence and sustain early on. You can use Ruthless Onslaught to get some poke, followed by a Hamstring for a few more auto attacks. 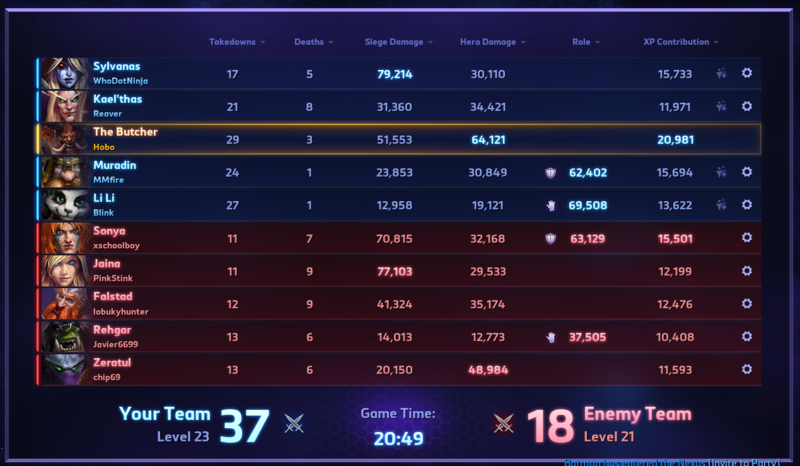 With the healing from Victuals, I was nearly able to lane vs anyone. Even 2v1 are not that bad with the healing you get per wave! Be aware of your mana, you can drain it fast if you are not careful. The main proirity for you is to gather that Fresh Meat. Ideally get as many stacks as you can before the first team objective. You can even push your lane, and quickly bounce to another on smaller maps like Tomb of the Spider Queen. Be very cautious about enemy ganks on you, loosing the stacks of Fresh Meat will hurt a great deal early on. The Hamstring build has less sustain than the AA build, but you have a bit more opportunity for early ganks! Once you hit level 7, your burst is quite high, especially with your decreased cooldown of Hamstring. Try to look for windows to charge with Ruthless Onslaught + Hamstring + Brutal Strike. Be cautious not to die! Since you are rolling without Abattoir, the penalty for dying is expensive. Continue to focus on stacking your fresh meat! By the time you reach level 10, you should already have full a full stack of 35 Fresh Meat. You should have already visited some other lanes for ganking opportunities with Ruthless Onslaught, continue to do so during the laning in between objectives. You have such a big range on this and you stun for 1 second, be sure to ALERT your team mates. Simply ping the enemy you are about to dive on, this will give them the heads up and they will likely commit to the kill with you. Communication is key! When you hit level 16, you can chunk down enemy assassins with ease. Your positioning and engagement can mean the difference in a team fight. Be sure to know where the back line is and where the stuns/CC from the other team are at. If they are on CD, you can go ham, but a stun during a Butcher's Brand could mean the end of you! Once a team fight is engaged, I typically dive the target that is the biggest threat on the other team. Targets like Kael'Thas, Valla, Jaina etc. should be dealt with and bursted down as quickly as possible! You can also wait for a melee assassin to dive your back lane. You can be a hard counter for many melee assassins and warriors with all of your self healing and burst. 7/02/15: Content Adjustments, more updates, game play guide added. 7/07/15: 100K Views - Thanks everyone!